Dr. Who - The Companions is for Ages 9-12. Dr. Who - The Companions was written by John Nathan-Turner. Dr. Who - The Companions was published by Random House Books For Young Readers. 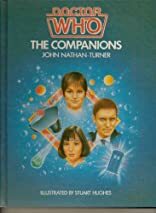 Subjects of Dr. Who - The Companions include Children: Babies & Toddlers, Children: Grades 4-6, Doctor Who (Television program, Doctor Who (Television program), General, Juvenile Nonfiction, Non-Classifiable, Pop Arts / Pop Culture, and Television - General.